Offer your cupcakes "by the each" and ensure they make it to their destination in one piece, with this standard-size single cupcake insert! This cupcake insert easily slips into compatible cupcake boxes to give your cupcakes a safe and secure resting place during merchandising, transport, and display. It's perfect for securing special orders from bakery to banquet, for unique wedding and event favors. Use it to send home single cupcakes from your trendy cupcake shop, for hungry customers or the recipient of their sweet gift to enjoy without a mess from tipping over or touching the sides of the box. These cupcake trays are great and were just what I was looking for. They fit snugly inside a 4" box and are nice and sturdy. They securely hold a standard size cupcake and are tall enough to keep them from tipping under reasonable movement. These fit well into the cake boxes. I wish the holes for the cupcakes were a tad smaller though. They arrive flat and are super easy to build. Works perfectly in the White Window Cupcake Boxes. Holds my cupcakes perfectly inside and keeps them nice and safe and easy to decorate while cupcakes are in the box. Another huge savings! We bought these from a local purveyor and they were often on back order. We have these a try and they are perfect. Same quality at half the price. These cupcake inserts are very easy to assemble and fit perfectly into the boxes. They fit a standard sized cupcake and keeps the cupcake from moving all over the place. The cupcake is stable during transportation and this insert allows people to sell each cupcake individually. Exactly as described. Good quality and cheap price. Perfect for regular size cupcake boxes. Need to make sure to purchase matching size boxes. Will definitely order again. Good size for a standard cupcake. Some of ours can run a little large and have a hard time fitting, but when we received these we just parred down our size a tad. These are awesome. They fit perfectly in the cupcake box and make transporting single packaged cupcakes so much easier and give you the piece of mind that they will not get messed up. Is was a little unsure if these would fit into the cupcake boxes that I had, but they were perfect. I was also about to make the cupcake larger than the standard size, and it fit like a glove! These inserts are a definite must have for your 4 X 4 Cupcake boxes, they securely hold the cupcake, and prevents it from rolling over in the box. Used these for a fundraising bake sale to add a level of class. The inserts folded together easily and fit perfectly inside the the 4x4x4 bakery boxes. The buyer felt like they were getting a higher end product and average cupcakes had no problems fitting. I got these to go with my pink 4" x 4" x 4" boxes but they were to big. i'm going to order the 4 1/2" x 4 1/2" x 4 1/2" boxes and see how they fit. Use these to hold standard size cupcakes cupcakes in a larger size box. They hold the cupcakes well and are made to keep your product secure. I messed up when I ordered these. I have 4 inch boxes, so they didn't fit, but with alittle modification, I got them to work! They are so nice to keep your lovely cupcake from getting all messed up! Love it! Fits the size of my cupcake perfectly (medium-jumbo sized cupcake). Highly recommend it and it fits the cupcake box that goes along with it too! These are very convenient! Perfectly holds one little cupcake in place in the matching pink boxes i prefer. 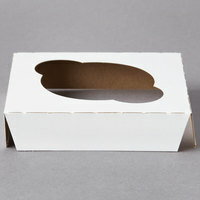 It is super easy to put together, just fold each side along the perforation, pop it into the box and it is ready to go! Cupcake Insert - Standard - Holds 1 Cupcake - 200 / Case is perfect for holding single cupcakes securely in place for transportation. Works perfectly for securing those precious cupcakes inside the box. Also gives the box a more finished/polished look. Here is a tip, Get the doubles and cut them in half for even greater value! Fits perfectly inside the 4 1/2" x 4 1/2" x 4 1/2" cupcake box. Very sturdy, holds the cupcake in place like a charm. I recommend decorating the cupcake after it's in the box. These don't fit the 4x4 size cupcake box that I bought but they fit nicely in the bigger boxes--these are a little hard to find and they are nice and sturdy. These work for my large cupcakes or regular sized muffins when used inside of the 4.5"x4.5" box. Keeps items secured and looks nice when customer opens box. Great for that single cupcake gift! Our customers love the option to purchase individuals or our cupcakes or muffins and gifting it to a friend or colleague. This single cupcake insert is perfect, fits perfectly tight, it's very nice to give my customers a really nice little box and know they don't have to worry about their cupcake on their way home, it makes them feel special. This cupcake insert is great. It fits perfectly in the 4.5x4.5 cupcake boxes. Cupcakes are a great fit and stay secure. Customers love it too! These cupcake box inserts fit perfectly into the 4.5 x 4.5 inch size cupcake boxes. The finger holes make getting a cupcake out easily as well. These are perfect when just letting customer sample a product on the go or simply a group of customers stopping in to tickle their sweet tooth & want try one muffin/cupcake. Holds in place greatly and non flimsy. This is A Must buy I am pleased once again. This will be a perfect fit to go inside of the cupcake box. I can't wait to showcase the cupcakes with the insert in the pink cupcake boxes. These are just perfect for our individual cupcake boxes. We originally ordered a different size, but the cutout was way too big. These are the perfect fit! This products works great in the cupcake box locking in the muffin making sure it doesn't slide. Now transporting goods are easy and no more worrying about messing up the frosting. These inserts are one of the best that iv'e ordered, i used every single one to transport 200 cupcakes to a birthday party. They look very nice, i would recomed this product to all who are trying to transport cupcakes. Excellent quality cardboard insert. The top is a glossy white, the bottom is a natural craft brown. Fits the 4.5"x4.5"x4.5" single cupcake box. The height of the insert is neither too tall or too short (I've had this problem with other cupcake inserts purchased through a different vendor), which means it holds the cupcakes perfectly in place. Definitely recommend! These cupcake inserts are the perfect accompaniment to the Cupcake Box 4 1/2" x 4 1/2" x 4 1/2". They are easy to fold, fit in the box nicely, and keep the cupcake in place for safe transportation! These holders fit both standard size and my larger size cupcake papers. The cupcakes are held securely so I have no worries about them shifting. Highly recommend! Hold my cupcakes in place. Does exactly what I need it to and seems to be good quality. Will order again in the future. Thanks! The worst thing is to get your beautiful cupcake home and discover the icing is all over the box instead of the cake. This insert keeps the cupcake in one place and far enough from the sides that your frosting won't bump against them. These inserts are perfect for the single cupcake/ muffin box. They are very sturdy and easily assembled. I will be purchasing these from this sight always. They go great with the box , g reat quality and v ery sturdy , w ould buy again , i recommended them to all my baker friends. This insert fits the 4 1/2 X 4 1/2 x 4 1/2 cupcake box perfectly! It is easy to assemble and very sturdy. A single standard size cupcakes works best in this insert. These cupcake holder inserts are a perfect addition to the individual cupcake boxes we've purchased. They fit great and hold a standard size cupcake perfectly. They are an affordable way to give our customers just 1 cupcake! These are great inserts!! Cupcakes are valuable and the decorations can be impressive and take some time to complete! Protect your customers purchase with these easy to use protective inserts!! These fit the 4x4 boxes perfectly. They are a good price and sell well for special occasions.We have returning customers who purchase these often. Thanks. I love using these for Cupcake favors and as give-aways for all types of events. I even use them for my son's bake sale at school. Perfect size for regular cupcakes. I recommend using them with the 4.5" x 4.5" Boxes. I already order the boxes these go in last year to put cookies in at Christmas for a small gift,so I order these to do cupcakes this year.They make a really cute gift. Just tie a ribbon around and make a bow.